Gary Glitter (born Paul Francis Gadd) is an English former glam rock singer-songwriter and musician.Though best known for a rousing rock anthem that has become a trademark sound at American sporting events, Gary Glitter was far from a one-hit wonder. His recording career began in the early days of rock and roll, and morphed through a hippie phase, glam rock, bad Seventies rock, finally, Eighties revivalism. But it may be for the wildly successful "Rock and Roll (Part II)," released in 1972, by which Glitter will be remembered. "Instantly nostalgic, but like nothing else on earth, `Rock and Roll' cut though everything that was around that English summer, through the T. Rex sparkle and David Bowie sashay, through Slade's patent stomp and Sweet's candied pop," wrote Dave Thompson in Goldmine, "and though it didn't quite make #1, it hung around the chart so long there's not another song on earth that recaptures the moment like [this] one." In 2002, Snapper records re-promoted The Ultimate Gary Glitter, a two-CD anthology of Glitter's music first issued in 1997, days after his arrest (see below), which covers his commercial breakthrough in 1972 up to that point; again it was moderately successful.In September 2001 he released a new album, On, that included material written before his 1999 British conviction. That material was to have been part of a project called Lost on Life Street until that album's release was cancelled following his arrest. By December 2004, after releasing a new single, "Control", Glitter was in the news again concerning his behaviour; NGOs had been petitioning the government with their own evidence aimed at arresting Glitter. Glitter moved to Vietnam. In 2005 Remember Me This Way, the documentary filmed at Glitter's career peak in 1973 (and originally released in 1974), was issued for the first time on DVD. Glitter's music itself still had an audience, further demonstrated by three new album releases, although all of them contained past recordings from the vaults, rather than new product. The first two new albums were issued at the same time, The Remixes and Live in Concert (the latter of which was a 1981 recording). 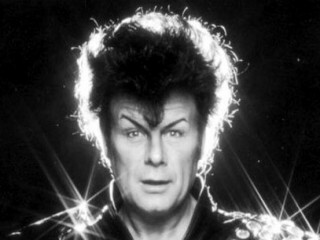 View the full website biography of Gary Glitter.